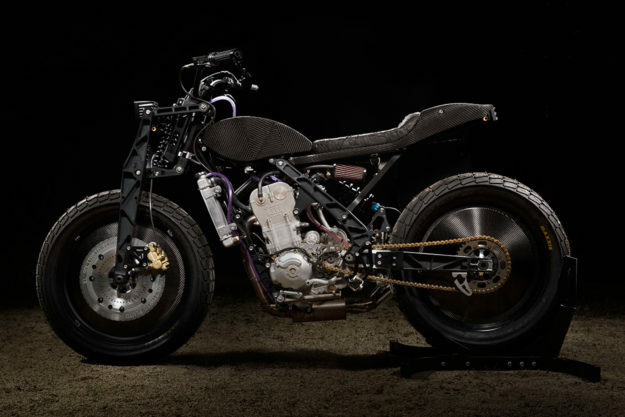 Batten down the hatches and don your flak jacket: The purveyors of the world’s most hated motorcycles are back. 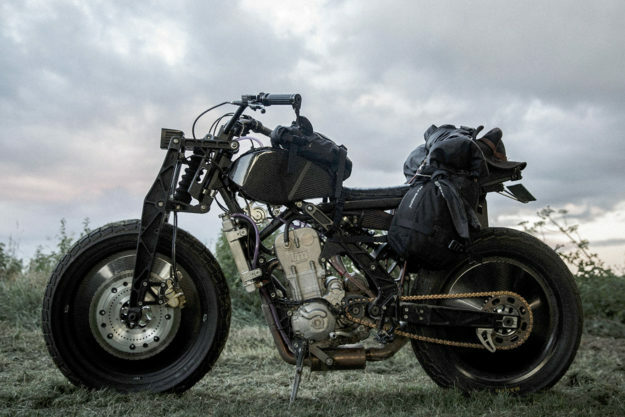 This time, the infamous El Solitario crew has done unspeakable things to… a Zaeta. 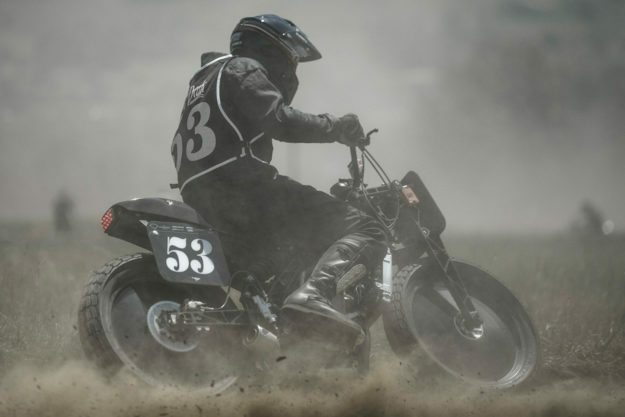 That’s right, you’re looking at a Zaeta 530 DT: A street-legal flat tracker powered by a 528cc DOHC single, making close to 60 hp and weighing a meager 255 pounds (115 kilos). It’s perfect for going sideways around a dirt track—and wholly inappropriate for long distance road trips. 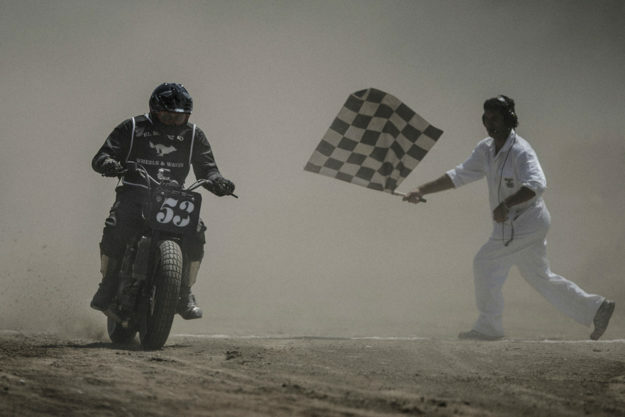 So that’s exactly what El Solitario did. 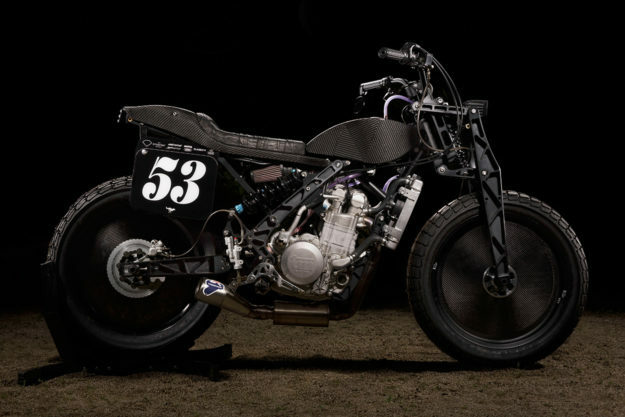 Once they finishing working their black magic on the Zaeta, they took it on a 1000-mile tarmac jaunt and raced it at Dirt Quake V.
The Zaeta 530 is a phenomenally radical machine out the box. 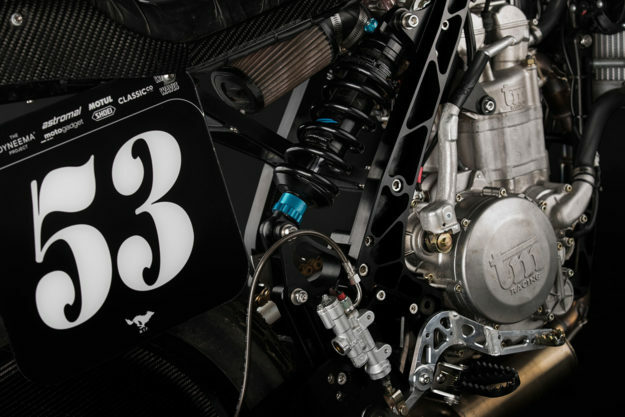 Tasty bits include an aluminum frame, Keihin flat-slide carb and Kineo tubeless wheels. This is not lost on Borras and co.—who sought to keep the best features intact while infusing the punchy little tracker with their signature dark aesthetic. Giulio Bernadelle, the founder of Kineo Wheels, was called in to assist. Designs were drawn up in CAD, and a plastic prototype produced before the final aluminum parts were made. 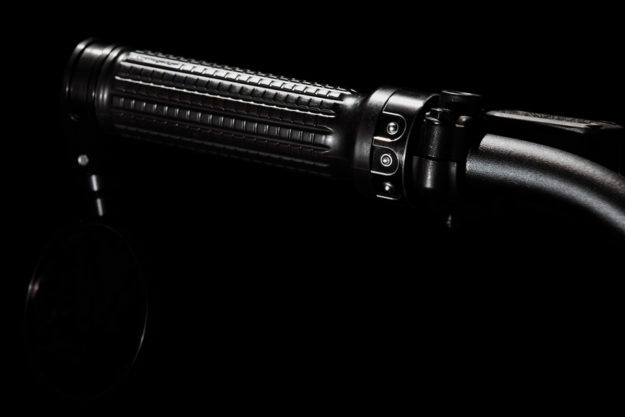 A custom Öhlins shock makes it all work. A shakedown was in order, but time was running out. 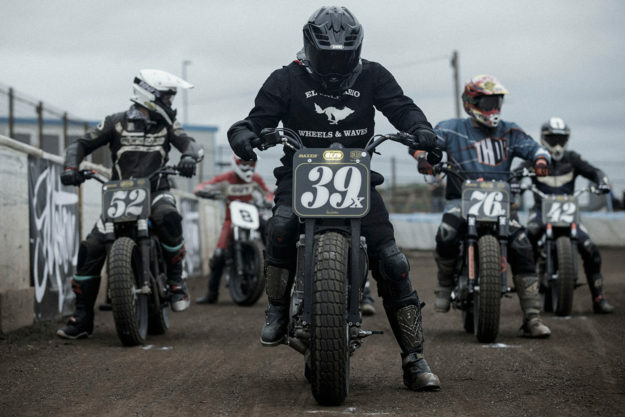 The forks arrived just hours before the El Rollo flat track race at Wheels and Waves—where El Solitario’s new technical partner, Mauro of Classic Co., managed to get the Zaeta onto the podium in the final. On went a set of custom-made carbon fiber wheel covers, courtesy of Astromal Speedway Parts. Then IXO stepped in to handle the carbon bodywork—a tailpiece and a cover for the aluminum fuel tank. Finishing touches include customized brake rotors, a number board and some eye-catching plumbing. 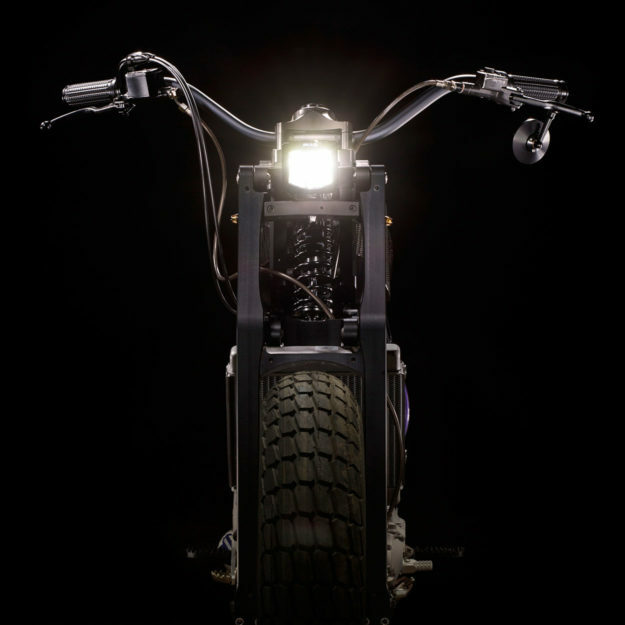 There’s a PIAA headlight attached to the girder fork, and a F1-approved LED taillight. 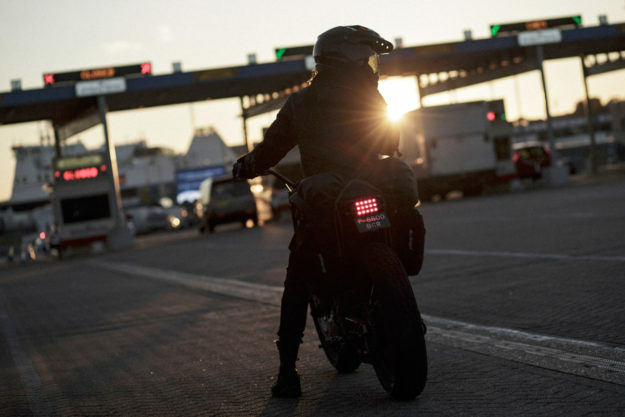 El Sol also installed grips, a speedo, mirror, blinkers and switches from Motogadget. 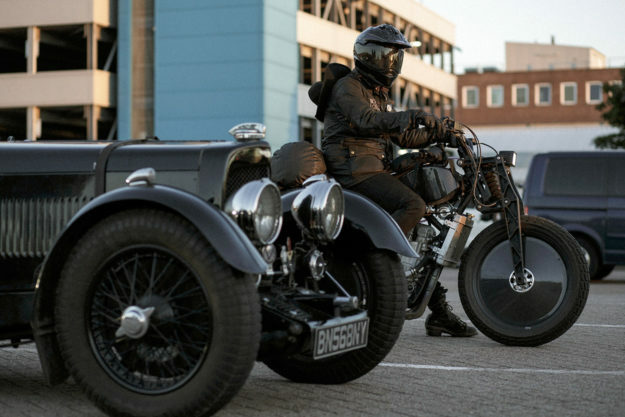 With Wheels and Waves behind them, it was time to really put E.S. Pluto to the test. 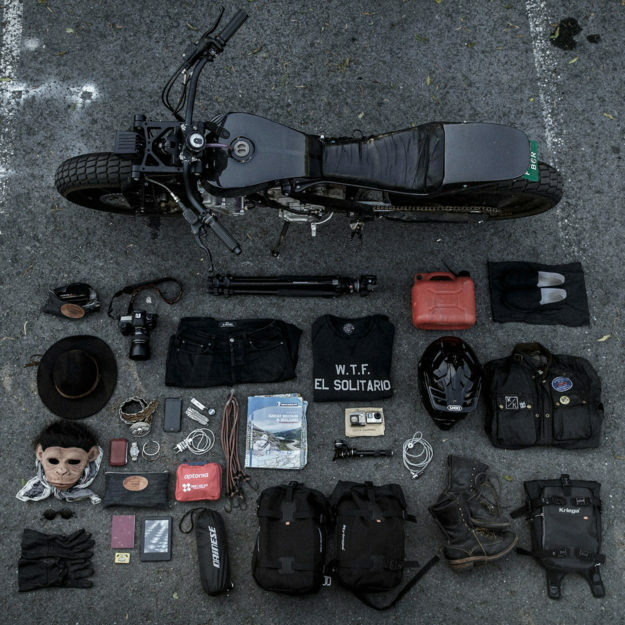 David pointed the bike towards the UK, intending to run the Zaeta in Dirt Quake’s ‘Run What Ya Brung’ race. And he made it, too: filling up every 80km, and changing the oil twice along the way. So, David, what’s it like on the open road? Hit ‘play’ below to see Pluto in action. Be warned: This clip is a bit NSFW, although probably Safe For Workshop.